The living room offers mountain views, with walkout access to the courtyard pools and hot tub. High quality furniture and TVs throughout the condo. Flip on the gas fireplace and enjoy a movie. Enjoy your home-cooked meals at the dining table, with seating for 6. There's seating for 3 more at the kitchen's center island, that doubles as more counter space. The kitchen features quartz counter tops and full-size appliances. You can see the pools and courtyard from the living room - this is your view! King bed comfort and a flatscreen TV in the master bedroom. The Cirque bathrooms are quite spacious, comfortable and clean. Shower and large separate soaking tub in the master bath. 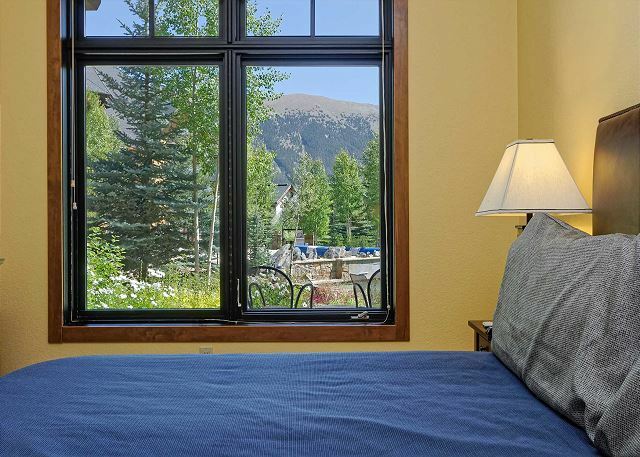 Beautiful mountain views from every window. The condo's third flat screen TV in the guest bedroom. The bathrooms are furnished with towels, toiletries and hair dryers. Super convenient washer/dryer in the guest bathroom closet. The patio in the summer. Relax on the sunny south-facing patio...even in the snowy winter! There's nothing better than a heated pool after a powder day! Or take a swim in one of the heated pools. Soak your day away in the huge hot tub. The Cirque's front entryway and grand staircase. The cozy common room at The Cirque, complete with wet-bar and access to the courtyard. Gather round the fireplace in the common entry room while waiting for your group. The common fitness room, with TV. Send your kids to the common area media room, where they can watch their cartoons. Kids love the common area kids' room complete with fuseball, games and TV. The media and game room helps make The Cirque family friendly! You won't need to scrape your car windows while parked in the Cirque's heated garage! The convenient ski locker room is heated with assigned ski lockers. 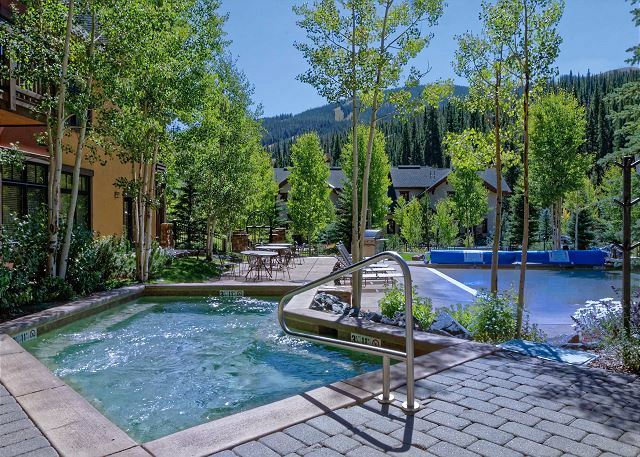 Mountain poolside luxury at Copper Mountain. The Cirque's one-of-a-kind courtyard with pools, hot tub, firepit and grill. This condo opens to a luxurious courtyard with 2 heated pools and a hot tub. The pools are heated year-round, and the walkways are heat-traced, so you can go barefoot in the winter! The Cirque opened in February of 2004. 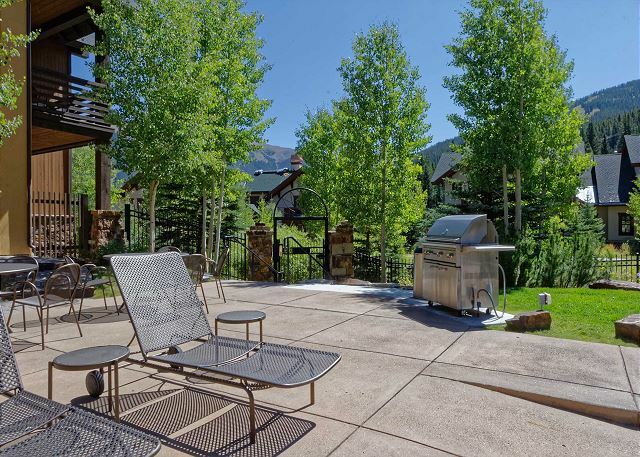 Look at the amenities, and you’ll see why it is the only property to earn the platinum rating at Copper Mountain. 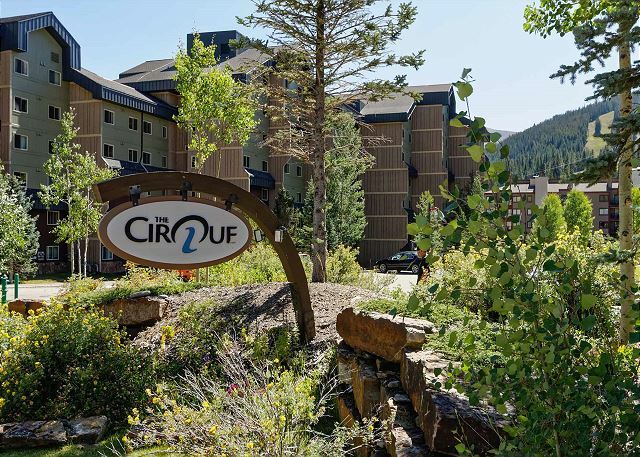 The Cirque is located between the new Center Village and Union Creek with easy access to all ski lifts and ski schools. During the non-snow months, you are less than a one minute bike-ride to the recreation path that goes west to Vail and northeast to Frisco. This unit is on the first level facing the mountain and has French doors that open right into the courtyard. 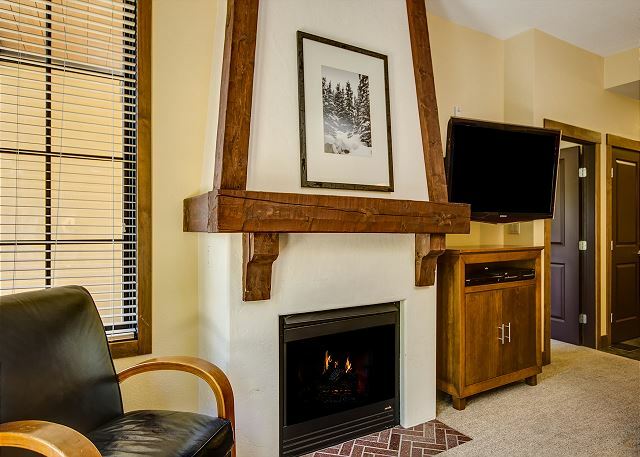 In the courtyard directly outside this unit, you’ll find two beautiful heated pools and a stunning mountain view along with such cozy community areas as the large hot tub, the state-of-the-art firepit, and a gas grill. The courtyard is heat-traced, so there is never snow or ice on the walkways. Footpaths lead off the courtyard right to the Union Creek beginner ski area and to the green, blue, and black runs off the American Eagle/American Flyer lifts in the center village area. Inside The Cirque, you’ll gather in the common lounge area with a fireplace and wet bar. Your Condo key card gives you free access to a media room with a big-screen TV with DVD. You’ll also have key access to a fitness and shower facility, and a kids’ room. When you book your stay at The Cirque, you’ll have well lighted heated underground parking, elevators, and ski lockers. This unit faces southeast and has spectacular views of the ski mountain, half pipe, and the 'sky chutes' on the Ten Mile Range. We are locals, and love to talk about living in Summit County, so please contact us, and we'll be happy to answer all of your questions. 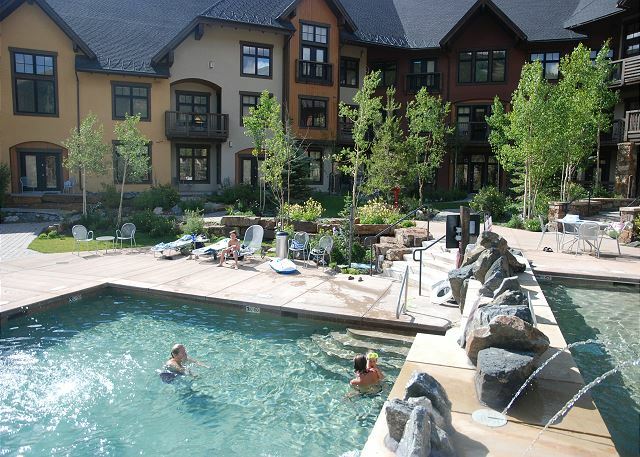 You can also book online at Copper Colorado Condos. We will respond right away and look forward to helping you with your vacation plans! Can't say enough good things about the Cirque! Where do I start? The Cirque was all we had hoped for and so much more!!!!!! We were so excited for our ski vacation and were even more excited when we arrived and saw the condo! The living room doors open up into the courtyard fit for a King. Our children were in heaven in the 2 heated pools and we could watch them from the condo but enjoyed the pools ourselves, maybe more than they did! The condo itself was impeccably furnished and decorated, the beds were wonderful, the bathrooms very nice with a large soaking tub in the master bathroom. The kitchen was updated and contained all the utensils we needed to cook dinner and breakfast in to save money. The owner, Leigh, is so nice and helpful. The condo was only available for one night, which was all we could afford and she promised us a discount on our next stay. We will definitely stay longer next time now that we know what we are looking forward to! Better then expected. This room was well maintained and upgraded. Looked like the absolute best complex at copper mountain. First of all the stay was remarkable being able to snowboard all day then walk barefoot to the hot tub. Entire week we were there we had the hot tub and pool to ourselves. Underground parking was great in the cold weather and unit had everything we wanted. 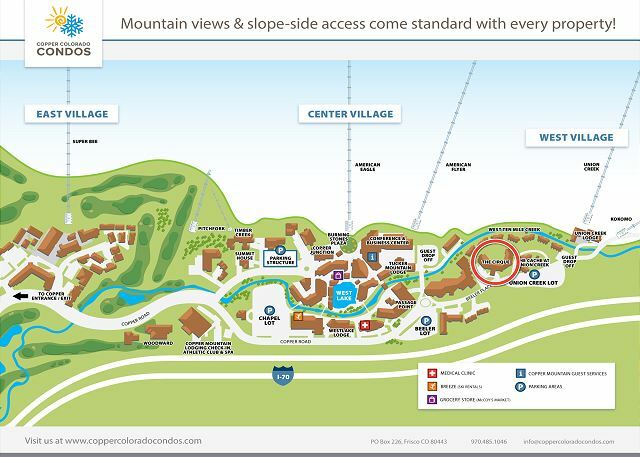 Short 5 minute walk or 1 minute drive to center village and American flyer lifts. Great shopping and the laid back local atmosphere was amazing. Can't wait to go back.